50 people are enough to overthrow a corrupt government!.. How 50 people overthrew their corrupt government and changed their lives forever!.. During the last dramatic months I’ve read a large number of articles on corruption in the political system, after the changeover of ’74 in Greece, and the incredible ease with which this political system demolished and sold out the country within a few months. I feel that everyone knows the same things, and we are partakers of the same facts and the same reality. I feel that everyone knows, but we DO NOT know that everyone know as well! … This is the time to open up the discussion about this great issue, among us, 11 million fellow citizens, who want to get Greece back! 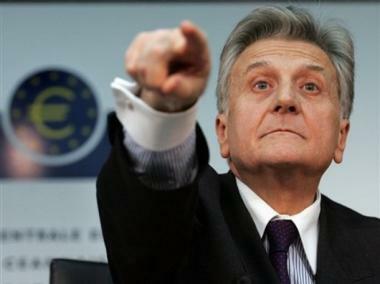 The following article* presents a critical knowhow on how to imediately get rid of occupying forces of the IMF MOU and the «American-European station masters» who pretends to be a Greek Govenrment. * I pay tribute to the great American professor Clay Shirky. I quote the seventh chapter of his latest book Here Comes Everybody which I consider to be the Bible on the potential of civil society, and the power of modern social networking tools, available, accessible and free to everyone. As more people adopt simple social tools, and as those tools allow increasingly rapid communication, the speed of group action also increases, and just as more is different, faster is different. Collective action is different from individual action, both harder to get going and, once going, harder to stop. As Judge Richard Posner put it, “Conspiracies are punished separately from single-offender criminal acts, and often as severely even if the conspiracy fails to achieve its aim, because a group having some illegal purpose is more dangerous than an individual who has the same purpose.” This is true not just of criminal intent. Groups are capable of exerting a different kind of force than are individuals, and when that force is turned against an existing institution, groups create a different kind of threat. To understand the difference, consider the events of 1989 in the East German city of Leipzig. At the beginning of that year a handful of Leipzigers began protesting against the German Democratic Republic (GDR), often staging these protests during an existing event – a street music festival, a fair, – that offered a way to get a mass of people together without arousing suspicion. At first the protests were small – in January five hundred people showed up, and the government arrested fifty of them. That didn’t deter the protesters, however. As the year progressed, the protests became more regular, taking place every Monday. When each subsequent protest came and went, more bystanders realized that the government was doing nothing to stop them. As a result, every subsequent Monday new participants joined in, which in turn emboldened still more citizens. Early on the marches were too small for the government to stop without looking hysterical, and every week they grew only a little. From the government’s pint of view, a small march was to little to crack down on, and the following week a slightly larger march was also too little to crack down on. Not until September did Erich Honecker instruct local governments to “nip these enemy activities in the bud” and “not allow a mass basis for them.” By then it was too late; the protests had long since passed from bud to full flower. What Honecker could not have known was that the “mass basis” was measured not by the number of participants but by the number of people who understood the protest was not being punished. The historian Susanne Lohmann calls the Leipzig protests an “information cascade.” Each of the citizens of Leipzig had some threshold at which they might join a protest. Every week the march happened without a crackdown offered additional evidence that the marches provided an outlet for their disaffection; each successful march diminished the fear felt by some additional part of the populace. The military often talks about “shared awareness,” which is the ability of many different people and groups to understand a situation, and to understand who else has the same understanding. If I see a fire break out, and I see that you see it as well, we may more easily coordinate our actions – you call 911, I grab the fire extinguisher – than if I have to call your attention to the fire. 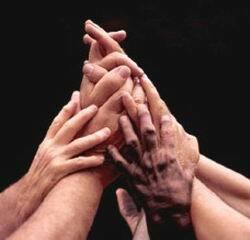 Shared awareness allows otherwise uncoordinated groups to begin to work together more quickly and effectively. This kind of social awareness has three levels: when everybody knows something, when everybody knows that everybody knows, and when everybody knows that everybody knows that everybody knows. Many people in the GDR figured out that for themselves that the government was corrupt, and that life under that government was bad; this is the “everyone knows” condition. Over time many of those same people figured out that most of their friends, neighbors, and colleagues knew that as well – “everyone know that everyone knows.” At this point the sentiment was widespread but because no one was talking about what everyone knew, the state never had to respond in any formal way. Finally people in Leipzig could see others acting on the knowledge that the GDR was rotten – “everyone knows that everyone knows that everyone knows.” This shared awareness is the step necessary for real public action: when the people in the streets of Leipzig knew the same thing as did the people watching from their windows. Wir sind das Volk! "We are the People!" By September 1989 this information had cascaded from a small group to a large one, and the marches had grown to tens of thousands of people. In October the number grew to better than a hundred thousand. 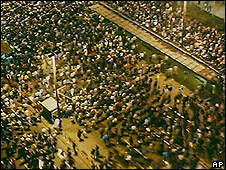 On the first Monday in November 400.000 people turned out in the streets of Leipzig. By the time the government realized its bluff was being called, no one in the army was willing to turn on so many citizens, and without a credible threat of deadly force to back it up, the East German government simply collapsed. 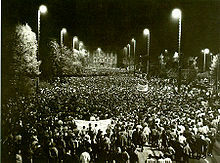 The day after that first November protest the entire East German government resigned. Two days later the dismantling of the Berlin Wall began. The GDR had vanished. Also please engage in the discussion below and provide your estimates, projections and correlations related to the current reality in Greece.